In the late 1970's an ambitious canal development plan for Broulee was proposed. 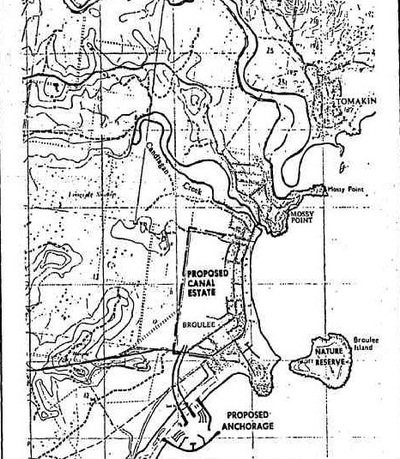 Consisting of a Large breakwall and harbour to be built at South Broulee with a large canal dug from South Broulee to Candalagan Creek with spur canals to provide "the best boating and waterside homes on the South Coast". The progress associations of Tomakin, Broulee and Mossy Point have been told of an ambitious canal development plan for their area. The developers have taken the plan to local people before seeking council approval - apparently as a result of the public resistance developers found recently in nearby Tuross after obtaining council approval to an extensive housing plan. The Broulee plan covers about 80 hectares of land behind Broulee, formerly owned by Wilmore and Randall but now the property of Canberra and Broulee man Mr Ian Fraser. The proposal includes a canal from south Broulee beach stretching north to Candalagan Street, Broulee. With spur canals, there will be provision for about 550 building blocks. A small breakwater for use by pleasure boats and professional fishermen is also in the proposal. Progress association members are inclined to favour the plan, but say they want more details before making a decision whether to support it. The concept of a canal development and associated deep-water anchorage was first presented to the local progress associations and the Eurobaballa Shire Council in May of 1979. The proposal was publicised locally at the time and covered by your South Coast correspondent. The area concerned lies immediately west of the Broulee township. It was the subject of a "dry land" sub-division commenced by the previous owners, in the early 1970s, but never completed. The land is generally level, consists of deep deposits of clean sand and is entirely devoid of any signs of mud. Part of the southern end, however, is low lying, and some years ago, together with an area of the existing town site, was subjected to flooding - the result of an elevated water table caused by consecutive periods of unprecedented rainfall. The flooding, which in some backyards was over one metre deep, affected dozens of homes and rendered useless a great number of septic systems. The experience was a costly one both for the house owners involved and for the shire council, which assumed responsibility for mitigation of the problem. The canal concept was not only spawned by the floodwaters, but also presented an obvious means of preventing their reappearance. The accompanying concept sketch, not to scale, illustrates one example. Eventual provision within such a harbour for a marina, boat club, fishing-fleet facilities and much needed launching ramps, would be compatible with long-term shire plans for recreational amenities in that region. More importantly, an all-weather entrance would help to prevent many of the recurrent boating tragedies which occur at the notorious river mouth bars in the vicinity. The end result would leave all of the important natural assets of the area untouched - Mossy Point Lagoon, Broulee Beach, Broulee Island and headland - while offering the best boating and waterside home facilities on the South Coast.